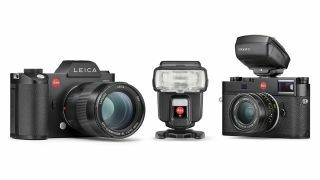 Leica has unveiled the SF 60 flash unit and the SF C1 remote control. The two new arrivals are designed for use with models within the S, SL and M systems, although they can also be used in conjunction with the company's APS-C-based CL model and the full-frame Q camera. The two can also be used together for the purpose of off-camera flash. As the name suggests, the TTL-supporting SF 60 flashgun offers a guide number of 60 (at ISO 100), and can be used as either a master or slave. Crafted with the familiar tilt-and-swivel design, the unit incorporates a zoom reflector, a diffuser and a reflector card, and can be used for high-speed sync shooting at shutter speeds up to 1/8000sec. Leica has also built an LED light into the front of the unit, and this can have its brightness adjusted over nine steps, making it well suited to those who may need to occasionally capture video footage. Around the back, the unit features a colour LCD panel, while power comes via the usual four AA batteries. Should you want, you can use an optional power pack to keep the unit going, which, Leica claims, also has the benefit of speeding up recycling times. The SF C1, meanwhile, is designed to be mounted inside a camera's hotshoe and used to wirelessly control one or more flashes. Units can be arranged in up to seven channels, each with three groups, and it's possible to access all the same functions as you would be able to on the flash itself. The unit itself has been furnished with an LCD on its rear, and even a microSD slot to allow for firmware updates. All power comes from two AAA batteries, and Leica reckons this should provide enough juice to last for around 3000 exposures. The SF 60 arrives with an RRP of £450 while the SF C1 has an RRP or £250, and both are now available to order from Leica's online store.